France is off to a beautiful start to 2018 — a year that could be a rosy one. At the end of 2017, the Economist designated France its “country of the year” following Emmanuel Macron’s election as president in May and the sweeping victory of his new political movement, La République en Marche! in parliamentary elections in June: 350 out of 577 seats for the presidential majority, more than enough with which to implement Macron’s ambitious reform package over the next five years. This week, Macron is on a state visit to China, where more than fifty contracts and partnerships are expected to be signed between French companies and their Chinese counterparts. Also this week, France, a leader in artificial intelligence, is once again heavily represented at the Consumer Electronics Show in Las Vegas. On the business front at home, merger and acquisition activity in France rose by 50 percent in 2017 to the highest level in ten years. The CAC 40 stock exchange index stands at its peak since the global financial crisis of 2008. The French themselves have become less gloomy, “resigned themselves to optimism,” according to one wag. A Harris Interactive poll found 59 percent of French looking ahead positively to 2018. A poll by Elabe for Les Echos and Radio Classique shows 61 percent of French believing the economy will improve in 2018. Political stability, regulatory reform, a positive economy: what could possibly go wrong? Beyond France in the wider world, a global crisis of confidence could quickly undermine this rosy picture. Whether via a government shutdown, an increase of tensions with North Korea or, for that matter, Iran, the unpredictability of the United States, in particular, constitutes a source of risk, especially as the country continues to be led by an unpredictable president and administration facing a sharply polarized political environment. Midterm congressional elections this year and special prosecutor Robert Mueller’s investigation of Russian interference in the 2016 presidential election could play one way or the other, as sources of greater certainty or uncertainty, depending on the decisiveness of their outcome. 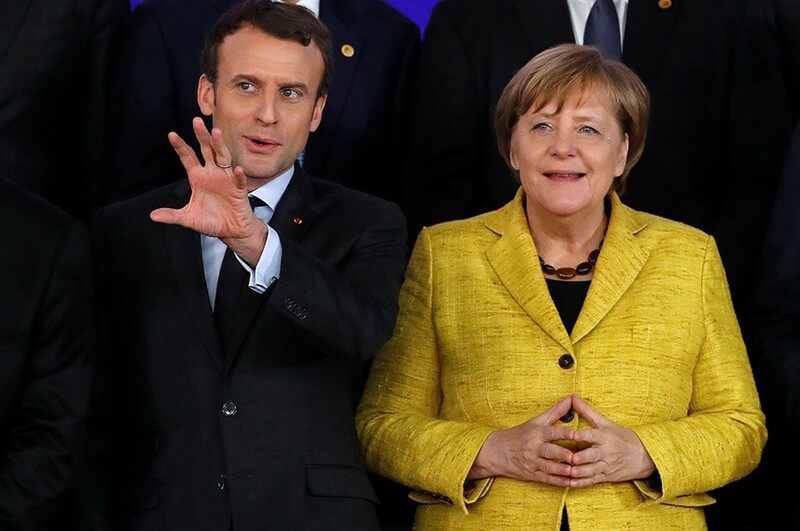 In Europe, French plans to relaunch a tighter core European Union (EU) could be dented by German Chancellor Angela Merkel’s inability to form a strong new government. If Merkel’s coalition negotiations with the Social Democratic Party (SPD) require big compromises or significantly reduce her room for maneuver, then her ability to support some of Macron’s proposals for a tighter economic governance of the eurozone could be thwarted. In the face of Brexit, the EU27 (the twenty-eight members of the EU less the United Kingdom) have thus far remained strongly united. Yet Hungary and Poland are recalcitrant about migration and judicial reform and risk confrontation both with their EU partners and with the European Commission in Brussels. Add the Czech Republic to this mix, and to some extent Austria (where the influence of the president, greater than that in Germany, may blunt some of the new chancellor Sebastian Kurz’s right-wing tendencies), and there is scope for the EU to start splitting after its impressive solidarity over the past year. Disagreements on how tough to be on Brexit, or the advent of another refugee crisis, could add instability to this mix. But the greatest potential threat to France’s optimism would be overreaching on the reform agenda. It would bring the French people out into the streets. Such a scenario could then, as in the previous administrations of Jacques Chirac (1995–2007), Nicolas Sarkozy (2007–2012), and François Hollande (2012–2017), bring reforms to a screeching halt. Macron rightly wishes to accelerate reforms in the first six months of the year, modernizing the constitution and government, focusing on training and apprenticeships, fixing unemployment insurance. If the government tries to go too fast, neglects to consult all the parties concerned or shows any form of arrogance as a result of its strong majority — a “we-can-do-what-we-like-and-you-have-to-accept-it” attitude — then the French, ever sensitive to any form of disdain or loss of privileges, could get angry. That anger in France generally leads to strikes, protests, and paralysis. During the latter half of 2017, Macron and the government led by Prime Minister Édouard Philippe showed great skill, professionalism, and, above all, patience in enacting the reforms to the labor code, conducting painstaking although tough-minded consultations with the unions and other civil-society representatives. If they show the same respect, realism, and discipline in approaching the next sets of reforms, then 2018 could actually be France’s year of La Vie en Rose.